Worked design size is four inch by 3.5 inch. I used a photo shop type product to create the blue background and then added (to this image) the flower design that I had downloaded. I then printed this image on Extrav Organza Silk For Inkjet Printing and after removing the backing sheet (needed by the printer) I had a thin organza fabric printed with blue background and flower design. 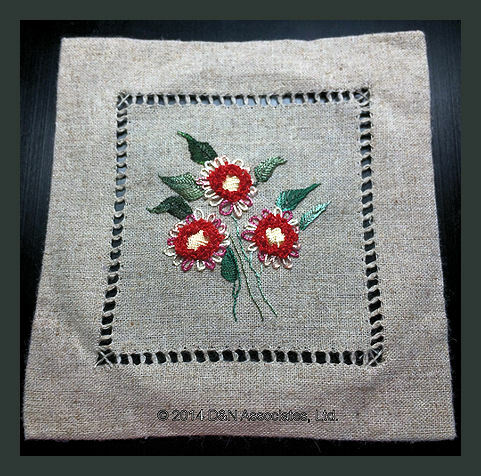 Once I had tacked the printed organza in front of a backing fabric (30 count even weave, white) onto a small set of wood stretcher bars I begun to stitch a lattice stitched background followed by the flowers design. Using the patterns suggested Glory 115, 131, 134, 215. I adhered to these colors except for the leaves where I used several green Glory from my stash. Lattice background worked in single stranded DMC, light blue. Stitches used: Leaf, satin, double cast-on, colonal knot and twisted daisy. Rustic Lantana flowers is one of the ways I stitched this design. Worked design size is four inch by four inch. Fabric, purchased from Nordic Needle, is a linen square pre-finished with the open work and a very nice hemstitch. The outside dimensions are approximately 6 inch x 6 inch. For transfer of the design I free-handed it using an air drying, disappearing marking pen. My transfer didn’t turn out great but what the heck I wanted rustic! Using the patterns suggested Glory 115, 131, 134, 215, I wanted a less refine look to the flowers and switched to Lola for the Lantana Blossums. I used several different green Glory from my stash for the leaves. 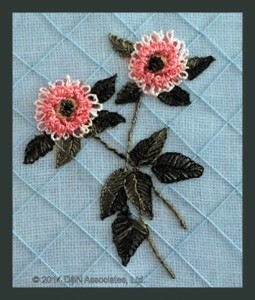 Also for the coral inner circle of each flower I switched from Glory to a Boucle thread, coral in color. Stitches used: Leaf, satin, double cast-on, and daisy.